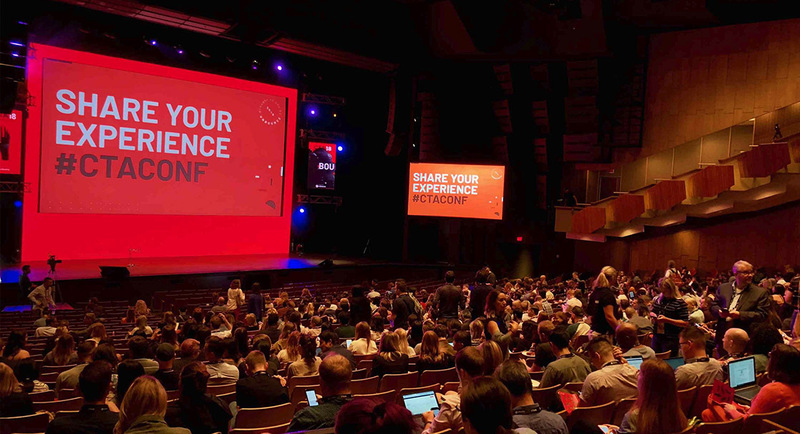 In August 2018, FirstPage Marketing attended the annual Unbounce Call-to-Action Conference in Vancouver, BC. The CTA conference was hosted at the historic Queen Elizabeth Theatre and provided great insights from digital marketing industry experts. The experience left our team feeling inspired, energized and ready to help our clients with proven digital marketing techniques. So how did a small Vancouver-based company become the organizers of a huge digital marketing conference? Well, more than 5 years ago, the CEO of Unbounce was pitched the idea of creating an annual digital marketing conference. The idea was to bring marketers together and provide them with actionable tips and industry insights that they could apply the very next day. The Call-to-Action Conference was organized as a single track. The participants in the conference sit in the huge auditorium at the Queen Elizabeth Theatre and the speakers take the stage one by one. During Andrew Miller’s presentation, a professional Social Media marketer, we learned that 80% of people on Instagram follow a business who is also on Instagram. We also learned that 93% of those who follow a business on Twitter intend on making a purchase from that business, proving that social media platforms can be leveraged as lead generation tools. Another fascinating bit of information we learned that was pretty shocking to the millennials in the audience: internet users across a wide spectrum still love to talk on the phone! In fact, 75% of users would prefer to make contact via the phone, whereas 24% would prefer to use a contact form. The remaining 1% prefer various other methods like chat windows or support tickets. The takeaway here is that your website should have a well-designed Contact Us page with your telephone number clearly displayed. In our line of work, there is an expression that states, “content is king.” This means that, in our current internet marketing landscape, businesses needs to be generating enormous amounts of rich content that can be shared, with the emphasis entirely on the production of the content itself. But what happens after that content has been created and shared? This question was posed by content marketer, Ross Simonds. Ross went into great detail about how us marketers are so focused on the creation of content itself, that we often ignore the distribution of said content. Ross presented us with the revolutionary idea that content is no longer king and instead, distribution is king! The key to distribution is to determine where your audience spends its time online and then to build creative solutions to reach them with this content. These creative solutions went beyond the typical distribution scope of posting to a website, Facebook, Instagram, Twitter, etc. and focused more on niche opportunities within social media channels such as Facebook groups and subreddits. During a well thought out and humorous presentation from Lisa Pierson—a popular content writer who took the audience through her personal experience with Match.com—it was made crystal clear to the audience that all websites should stop bragging about features and instead, present the benefits to the viewer in well thought out written content. The idea is to make the customer the “star of the show” by talking less about one’s own business and more about the customer’s needs. It wouldn’t be a digital marketing conference without plenty of insights and tips with regards to Search Engine Optimization (SEO) and Pay Per Click Advertising. This was by far one of the most technical aspects of the conference. We learned a lot about searcher intent and the always changing Google algorithms that are now prioritizing local search results more than ever. This means users no longer have to include a city or regional keyword in their search query. Instead, Google is using data from browsers and GPS signatures to serve up results that are targeted to the viewer’s actual location, making SEO more and more necessary for local businesses. Each day on our commute home on the West Coast Express train, our team enjoyed discussing the revolutionary ideas we learned at the 2018 Unbounce Call-to-Action Conference. Going to conferences ties into one of our core principles: constant learning. Our goal is to stay open minded to new marketing ideas. Getting your company’s message out into the world is becoming more and more challenging due to increased noise and competition—but we don’t have to tell you that! If you are already feeling like your digital marketing is not cutting through the noise, let’s start a conversation about internet marketing. Contact us today to learn more about our digital marketing services.